Roll, push or pull up to 40-tonne rolling loads. UMS has announced a new range of pedestrian-operated, battery-powered, materials handling units, for the safe and efficient handling of heavy rolling loads in a variety of industry applications. Based on the air-powered ‘A’ series range, the PowerHandling ‘B’ series range of battery-powered units have the capability to roll, push or pull as much as 40-tonne rolling loads (on the flat) utilising a high-capacity electric motor that operates off rechargeable battery packs connected to the handle shaft of the unit. The extremely compact design (base is only 250mm x 300mm) features large 100mm diameter, bearing mounted rear wheels for easy manoeuvrability and an ergonomically angled handle grip that provides precise variable speed and torque adjustment while being able to rotate 360° for a choice of push-pull grip positions. Telescoping handle shafts feature a quick-release locking clamp allowing quick and easy adjustment to suit the height of each operator. Easy to install/release battery packs are housed in the handle shaft and when depleted, are quick-charged (typically 45 minutes) in either a single or double-station 110/240V charger. With no air lines or hose to worry over, this versatile ‘B’ series range can easily manoeuvre rolling loads anywhere on an even surface. 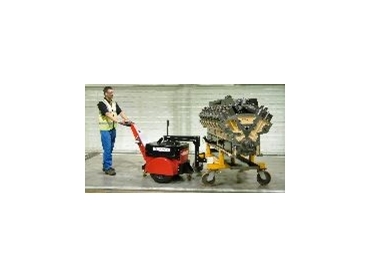 More robust applications on rugged uneven surfaces, indoors or outdoors, require the Power Pusher or Power Tug range. The Power Pusher is a pedestrian-operated, battery-powered tug unit designed to push rolling loads up to 40 tonnes in weight. The Power Pusher model features a 240V dc electric motor with on-board battery charger and 2 x 60A/h sealed and maintenance-free batteries that simply plugs into any electrical outlet for top up (typically 4/6 hours). The unit features an easy-view handle position LCD showing remaining battery life/hours of use for your assistance. A wide range of standard and bespoke attachments enabling connection to your load ensures that this model, with more than over 23,000 units sold worldwide, is the material handling unit of choice.